Well, friends, it’s official — Meghan Markle, or we should say, Duchess Meghan of Sussex, is royalty. Prince Harry and Meghan’s wedding celebration started at noon local time at St. George’s Chapel at Windsor Castle. Meghan traveled to the grounds with her mother, Doria Ragland, breaking with the royal tradition of the bride traveling with her father. Meghan’s father, Thomas Markle, was not in attendance after suffering health issues and a week of tabloid drama over him selling staged paparazzi photos. Prince Charles walked Meghan down the aisle in his place. Adorably, all of Meghan’s bridesmaids were children, following in British royal tradition. For her dress, Meghan wore an open bateau neckline dress with three-quarter lengths sleeves created by British designer Clare Waight Keller according to the palace. “Ms. Waight Keller last year became the first female Artistic Director at the historic French fashion house Givenchy,” Kensington Palace wrote on Twitter. Her long, sheer veil holds symbolic meaning too — it was designed with flora representing all 53 Commonwealth countries. 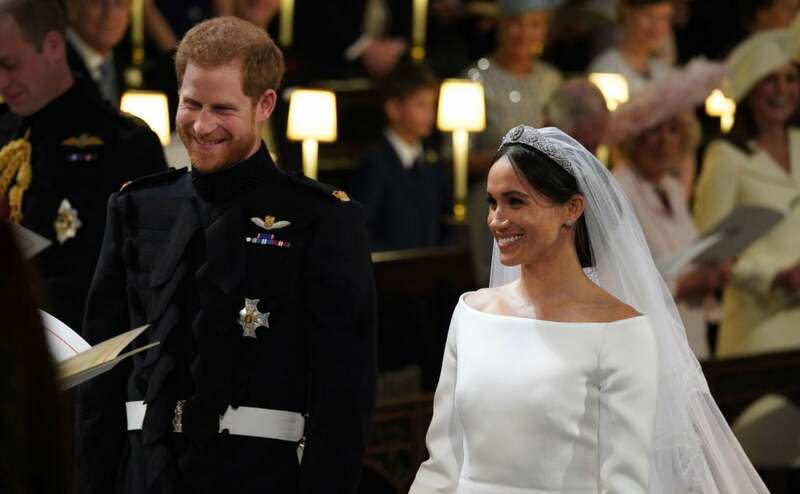 Her hair was loosely pulled away from her face, and the stunning, sparkling tiara is Queen Mary’s diamond bandeau tiara, which the queen lent to Meghan for the ceremony. It was created in 1932. 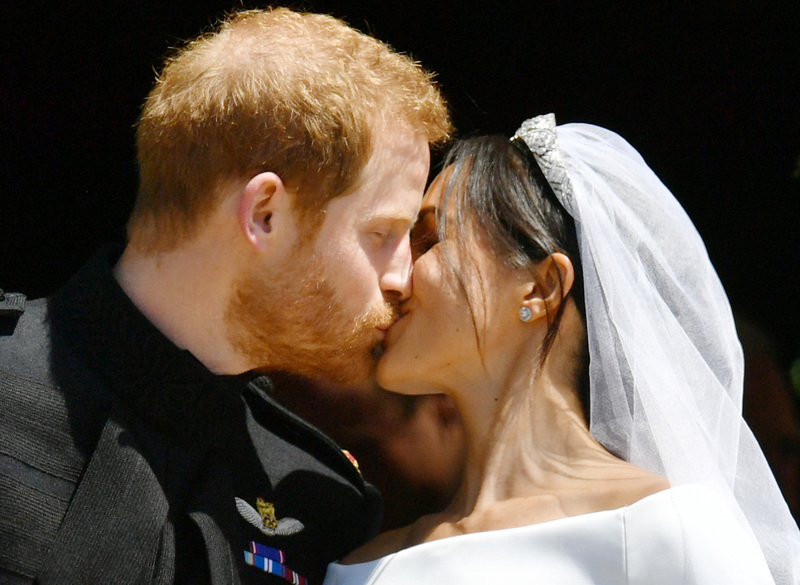 Following in the footsteps of Harry’s late mother, Princess Diana, and Meghan’s new sister-in-law, the Duchess of Cambridge, Meghan chose not to “obey” Harry in her vows. The ceremony featured several readings from Song of Solomon, and the Most Rev. Bishop Michael Curry, the first Black presiding bishop and primate of the Episcopal Church, gave a sermon quoting Dr. Martin Luther King and referencing American slavery and the power of love. “Imagine a world where love is the way. Imagine our homes and families where love is the way… When love is the way, then no child in this world will go to bed hungry ever again… When love is the way, Earth will be a sanctuary.” Meghan and Harry held hands throughout his sermon. Karen Gibson and the Kingdom Choir sang “Stand by Me” before the Archbishop of Canterbury read the couple their vows. Notably, Prince Harry has chosen to wear a wedding ring. Prince William does not wear one. Oprah Winfrey was in attendance, along with George and Amal Clooney, David and Victoria Beckham, Serena Williams, Idris Elba and many other notable guests, including many of the former actor’s Suits costars. Their wedding cake was a lemon-elderflower cake created by pastry chef Claire Ptak. Congratulations to Prince Harry and Meghan, the new duke and duchess of Sussex!